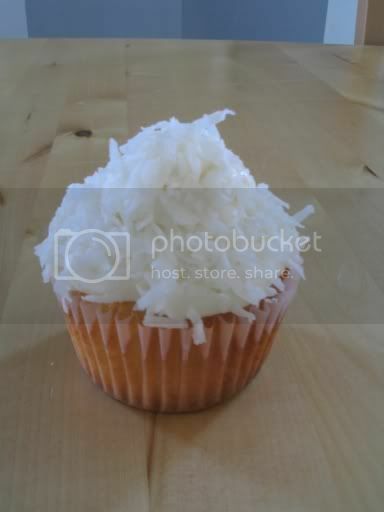 Cupcake, my love: By George I Think I've Got It! I think I'm starting to get the hang of cake decorating! At first, what seemed like a daunting task, how now become some sort of happy chaos in my life! 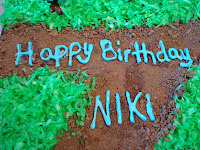 When a close friend (Michelle) called and said that it was her daughter's birthday and she'd like me to make Niki a cake I have to admit I was a little nervous. 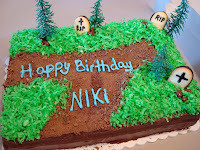 The theme of Niki's birthday party was "Death of a Teen Idol", which was this huge murder mystery plot. Each girl that was coming to the party was e-mailed her "character" a week in advance, and she was to come dressed and in character to the party. The party, which was an entire day's event would have a horrendous murder, where one of the party attendants was the killer, and the whole idea of the party was to find out who the killer was. 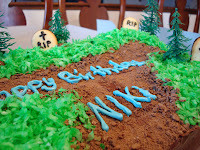 Seeing as how the party was based around a murder, Michelle wanted a graveyard cake. So at first my mind was reeling with ideas. I'd have a spooky tree and crows and tombstones, maybe even a skeleton...Whoa, whoa, whoa...I suddenly realized that my cake was starting to sound more like a Halloween cake than a birthday cake. So back to the drawing board I went. I started with a "Death by Chocolate" cake, which was probably one of the best chocolate cakes I've made! When I was shaping the cake I couldn't resist and had a bite of the "throw away" pieces, and I almost died! Pure chocolate bliss. I then covered the cake in chocolate frosting...of course! Now to the decorating. I knew I wanted tombstones but I didn't want the cake to look gothic, which is where the green grass (which is actually food colored coconut) came in. 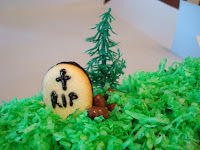 My tombstones are made out of Milano cookies, the pebbles are chocolate covered raisins and the tress...well they're fake. I said I think I got it, not that I was a cake decorating pro. With my planning I realized that writing Happy Birthday across coconut was going to be a little challenging, so I decided to make a dirt path for my message, which is made out of crushed chocolate graham crackers. Wonderful creation - you really have great skills with your cake decorating!! Awesome, awesome cake. the grass is the best part. And that is one fun mom to plan a party like that.